Sep/Oct, 1998 on Page 4. This issue is still available! Click here. The weather here is very, very hot. Blistering! I am sure to lose the skin off the back of my neck from several hours of exposure today, even with my safari hat on. The natives work directly in the hot sun all day, every day. It does not seem to bother them. 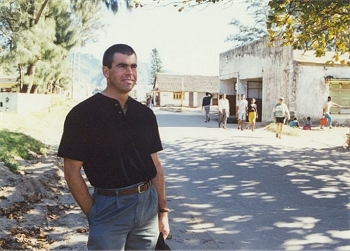 This country has never been explored for mineral resources with the use of modem technology. Most of the natives are not even using shovels! Most often, they use small metal salad bowls to excavate the sapphire-rich gravels from their digging holes. The gravels are loaded into burlap bags and carried long distances to the nearest water for processing. Sometimes water is miles away. Some miners process less than a cubic foot of gravel per day. Yet, they have bags of rich blue sapphires to show for their effort. This morning, our guide took us out to a small digging area close to this camp. 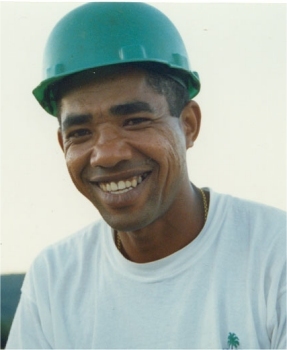 There has been a substantial rush of Malagasy miners into this area because of a very recent sapphire discovery of huge proportions. As the discovery continues to be defined and developed over the coming months and years, it will likely evolve into one of the largest sapphire finds in history. We are fortunate to be here right at the beginning. No other western mining companies are here, yet. 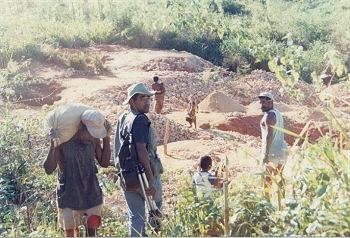 There are presently an estimated 10,000 (and growing) Malagasy hand-miners working in the field. But, the deposit is so large, they have not even scratched the surface. And because the truly-rich stones come from deep diggings, these hand-miners will need to settle for the surface deposits, which by themselves, are enormously rich. The small area we went to this morning was being dug by hand-miners less than a meter below the surface. They were turning up lots of nice blue stones, some of them large in size. The excitement was felt everywhere. Even young children were digging and pulling blue stones. It was explained to me that it only takes one good stone to support a local family for a year or longer. 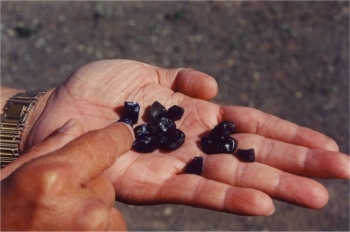 Such stones are being found every day by hand-miners. A truly good stone can set a family for life. These turn up often. But the best stones are found deep, where only heavy equipment can go. The largest sapphire found so far was discovered near here only several months ago! The native who found it, and all his heirs, are set for life! My client is the person who owns the commercial rights on a lot of this property. The local hand-miners are providing a very valuable service, even though they are removing millions of dollars worth of stones from his properties. Where local miners are finding great value at the surface, mechanized equipment will turn up a treasure trove of the highest-quality material upon bedrock, several meters below. One small mechanized operation has been recovering as much as 50,000 carats of sapphires per day along the bottom in just one area. 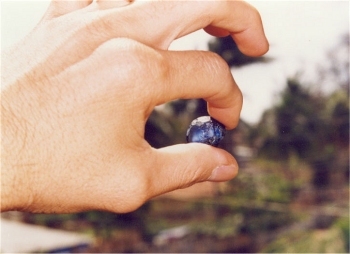 My clients expect to recover 370,000 carats of gem-quality sapphires out of just one small dig over the period of about a year. That is a conservative wholesale value of 15 million dollars for one small dig. Yet this is only a drop in the bucket. They are planning to launch several simultaneous operations; but they admit that they will never be able to effectively cover the vast rich deposits located on their concessions. The deposit is estimated to cover at least 100 square miles! I saw one man tied to a tree with his arms fastened to his sides in the central part of the boom town. I assume he was caught stealing or jumping someone else’s claim. Justice is dealt out harshly and swiftly here. It is a good place to stay out of trouble! Sapphires were being shown and traded everywhere in this boom town and elsewhere. In fact, I have not gone anywhere during the last week where people have not flocked to me, asking if I want to buy sapphires. Because we are white, and presumably rich, people are literally attacking us with their sapphires; handful upon handful of rich blue and green stones. I saw some the size of cherries, and am told they are being found much larger. Today, I could have bought buckets full! At one point this afternoon, I thought there was going to be a riot, or that we would be crushed by the sheer force of people trying to sell us these beautiful stones for pennies on the dollar of their actual worth. I was told to not take any money out of my pocket, for fear of a stampede. Sapphire buying under these conditions could be dangerous! Since I am here at the bequest of clients, I have behaved myself and focused on capturing some of the experience with my camera. I have to close now because we are getting ready to plan tomorrow’s events, which, I am certain, will be every bit as exciting as today. Tomorrow we will visit a place where several thousand hand-miners are digging their fortunes with nothing more than salad bowls! Tonight, despite my exhaustion, I cannot shake the excitement from what we witnessed today in the sapphire diggings. I thought the last few days were blistering! Today, to get to this new discovery, it was necessary to hike several miles up a rather steep incline to the top of a mountain plateau, where literally thousands of hand miners are working a newly-discovered shallow sapphire deposit of enormous proportions. It must have been 120o F in the shade! Unfortunately, there was little shade to cover our ascent of this mountain. We were traveling light, though, compared to the hundreds of local supply couriers who were hauling materials up the mountainside to support the extensive mining activity happening at the top. I saw people carrying huge loads, mostly of food and basic supplies. Even the younger, stronger couriers were sweating today. At the top, we found yet another sizable boom town of at least a thousand people. There were restaurants and shops of all sorts. Three weeks ago, there was almost no habitation here. This shanty-town has been erected along both sides of the trail, just on the down mountain-side of a big strike. Excavation pits are everywhere, all throughout the town, and even along the narrow trail. My first thought was to make certain to be off the mountain before dark. 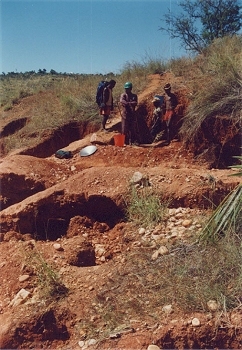 Some of the excavation pits had no bottom in sight. What a shock to fall in one of those pits at night while looking for the bathroom! What bathroom? We did not nearly reach the top before local miners started approaching us with their stones. Local stone buyers were around everywhere, as this is where stones can be purchased at the lowest price. The miners came to us in hopes of receiving more money for their labor. So we were slowed down a great deal by the scores of miners who wanted us to have a look at what they had found. This did not conflict with our mission, though, because we went there for the exact purpose of seeing what the local miners are finding. 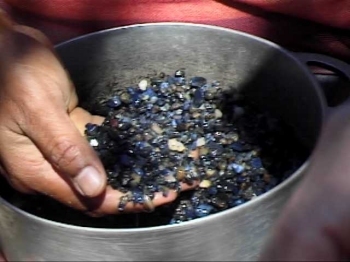 There is no doubt the local miners are finding impressive volumes of rich blue sapphires! The diggings were so extensive that we could have easily devoted an entire week up on that single plateau and not see it all. We picked only one erosive canyon to explore on this day, and it kept splitting off over and over again, with mining going on up every split that we saw. So we only touched upon a small portion of the diggings. 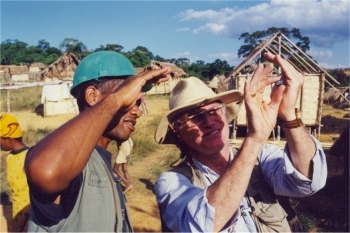 Most of the excavations were small in size, with a bottom in sight. I think the reason for this is that the dirt and gravel must be packed out of the holes. At the point where the hole becomes deeper than three meters, the material needs to be taken out in buckets on ropes. This takes additional helpers. I am assuming the miners must have decided that it is more efficient to dig out of shallower holes. And digging they were, everywhere we went! This arrangement makes my clients very happy, since the pothole method assures less than a third of the surface deposits are being worked, and almost none of the deep deposits, where the truly rich stones lie waiting. I say only a third of the surface deposits; because in their haste, the local miners shovel their tailings and waste material over about two thirds of the ground while digging their pits. 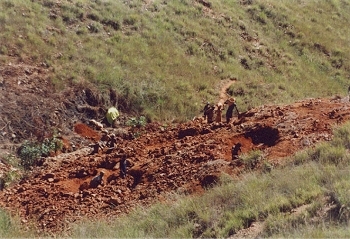 Then, rather than dig through their own tailings again, they move on to a new location once an excavation pit becomes too deep to work efficiently. There is no shortage of new places to work. People were digging everywhere, with everyone we saw having sapphires for sale. We did, however, see several deep digging operations today. One had miners down in a very deep hole, using buckets and ropes to get the dirt and gravel to the surface. We were told the excavation was over 30 meters deep. This group had the biggest and highest-quality stones we saw all day. I saw one miner going into a deep, narrow hole with a lighted candle in his hand to illuminate his work area. He was smiling. Going down into that small, unsupported crawl-hole, I would not have been smiling no matter how rich the sapphires! My clients asked if I wanted to capture the underground diggings. But fortunately, the batteries for the light to my video camera were not charged. Too bad! Another larger group of hand-miners had apparently tapped into some kind of natural cave system, saying that they were excavating several kilometers into the earth. They also had very rich stones to show for their effort. I am told this new area we visited today has sprung up over the past three weeks. 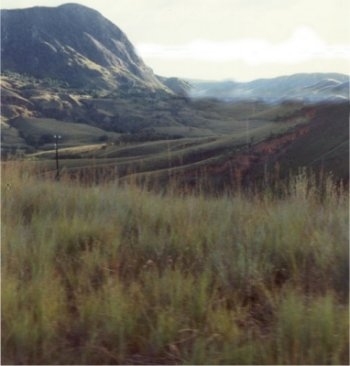 My clients surveyed this area a month ago, and say there were only just a few miners, and no town existed there before. Now the place is crawling with people. I am told this very same thing is happening all across a very large geographical area. This adventure is just beginning, and I look forward to future visits to follow the development of this magnificent find.